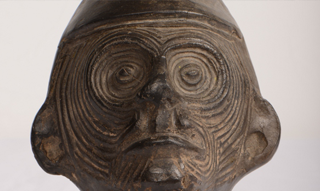 Reading Museum's world collection is an eclectic group of objects including weapons, domestic objects and costume, particularly from West and South Africa, North America and South America and South East Asia. Highlights include Japanese ivories from the Petrocokino Collection, and Congolese objects collected by the Baptist Missionary Society. Almost all of the objects were gifts from local people, usually gathered during visits and missionary work in the late nineteenth and early twentieth centuries. Many objects were later included in, or were collected for, the Museum's school loan box service. There are currently 593 items in this group online. Press Go now to see all of them or choose a keyword from one or more of the categories below then press Go. (Click in a box to view the drop-down list). Choosing more than one keyword may result in no items being found.